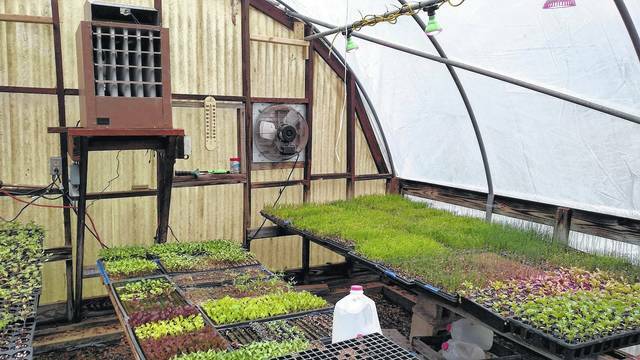 Furhmann Orchards already has produce coming up in greenhouses. Local orchard owner Paul Fuhrmann says this winter’s weather patterns will hit local peaches hard but his apple production should increase. Fuhrmann’s parents Pete and Susan Furhamann started Furhmann Orchards in Wheelersburg in 1958. Pete was a pitcher, who signed with the Cleveland Indians. In what seemed like an unfortunate turn, Pete threw out his shoulder in spring training. He went home to his parent’s small hobby farm with a couple trees and grew the orchard that is known throughout most of the region. The family continued to expand the business throughout Paul’s life. In 1964, they built the building that currently stands and is open and packed full of produce during the summer and fall months. They added onto that building in 1977, rebuilt in 1978 and added another building in 1992. Over the years, what started as just a few trees has grown to a total of 60 acres of apple trees, five acres of peaches and 20 acres of miscellaneous vegetables. Peaches came in approximately four weeks earlier than normal as a result of the warm weather the area had this February, Paul explained. Once those temperatures dropped, the cold and frost damaged many plants. “That pretty much wiped out the peaches,” Paul stated. He added that the weather pattern has created an issue for all orchards along the east coast. Fortunately, he says the farm should be okay. Fuhrmann’s is known for its apples, which Paul says are coming along nicely. Paul credits much of the apple success to the second site. Other than the smaller home site, Furhmann’s grow the majority of their apples at a remote site on a hill in Lucasville. Paul explained that the higher location helps to prevent the product from being damaged by frost. Still, he will be relying on other produce to make up for the loss of peaches. Furhmann’s offers a variety of fresh, local produce. Being picked next month will be asparagus and some varieties of lettuce. They will have tomatoes starting the end of May/beginning of June. Then, sweet corn and green beans will be picked in July. The big finale of the season will be apples that will start at the end of July. Furhmann’s offers a variety of apples from ginger colds to granny smiths. The orchard offers apples all season with several early and late season varieties as well and some regional varieties. Even more exciting to Paul was the announcement of the orchard’s new varieties. This year, they will be offering evercrisp, a cross between honeycrisp and fugi. The apple keeps longer like the Fugi apple but also has the crisp of the honeycrisp. The evercrisps were planted a couples years ago, bringing in five bushels of apples last year. Paul explained that this year he is expecting closer to five bins. Also new, Furhmann’s will be planting summerset apples in the coming years. Paul explained that summerset is a product he is excited to offer to the people because it has a better crisp than honeycrisp, ripens ahead of honeycrisp, and performs better than honeycrisp in taste tests. “Honeycrisp doesn’t do will in this area of the region,” Paul added. The new apple varieties are part of a recent revitalization of the orchard. Paul has replaced 14 acres of apples with the expectation to replace more next year. As a result, he has had a lot of young trees. As these trees mature, he expects production to increase. At its peak, Furhmann’s has produced 32,000 bushels. Production has since dropped to under 20,000. Paul says, with replanting and expansions, he expects to reach those peak figures again within the next couple years. “Now, the fruits of our labor are about ready to pay off,” he commented. Furhmann’s produces for a local market. Much of that clientele is local consumers visiting the orchard on site; however, he also provides produce for some local groceries including Deemers in Wheelersburg, the Minford IGA and the FoodFair chain out of Huntington. It is important to Paul that his product remains local. “Local is anywhere a truck can go in a day,” Paul stated. He explained that local produce is fresher, potentially safer and supports a local economy. “I try to produce the best stuff possible” he explained. Even the cider is locally made. Furhmann’s is open during peak apple season – from Labor Day until Christmas. They are located at 510 Hansgen Morgan Rd. in Wheelersburg. Information about the orchard and available produce can be found by visiting the Furhmann Orchards Facebook page. Reach Nikki Blankenship at 740-353-3101 ext. 1930.